We have just returned after spending a very enjoyable two weeks here.I was worried about how it would be after reading some of the comments posted about the hotel but I needn't have been.We have an 8 month old baby so spent time every day in the pool as babies and sand don't mix with no problems at all.The staff were all very friendly and helpful and the room even came equipped with a kettle which we have never had on holidays to Greece before and a cot was provided even though we hadn't asked for one.I really couldn't find fault with the hotel and we had an absolutely beautiful view across to Lixouri,in fact I wish I was there right now and when we return to Kefalonia in the future we will hopefully stay there again. Stayed here May 2002 on the top floor in the self catering rooms of the hotel overlooking the bay towards Kalamia Beach. Nice clean hotel with a nice pool but who needs it when your this close to the Kalamia. TV in the room also, not that it was used much. I was most disturbed on reading some of the comments re: this hotel. Even to the point of calling Kosmar with whom we had booked to see if it would be possible to re-locate. However I am glad that the rep. suggested we try the hotel first and then if it was not to our liking talk to the reps at that point. We didn't arrive at the hotel until 11p.m. The staff dealt with our registration quickly and efficiently. I was hungry and it was no trouble for them to make me a sandwich of my choice. The breakfast staff dealt with both the laying out and clearing away of the food quickly and quietly. Therefore I would say my experience of the hotel was very good. Yes, it is basic (but it also doesn't cost a fortune). In my experience it has everything you would expect for that price bracket. The staff were friendly and the place was clean. The location and views from the hotel are excellent, and I and the other three in my party would certainly stay there again. My friend and I stayed at this hotel for a week and found the staff to be friendly and polite. 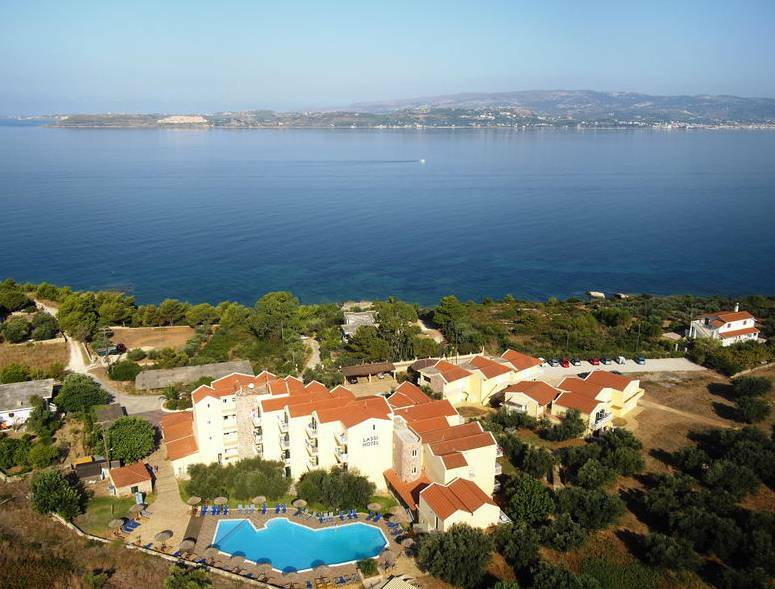 The hotel itself is basic but is in an excellent location, being near the tavernas, beaches, shops (Dolphin Market) and not far from Argostoli. The breakfast is simple but enjoyable (cereal, fruit, croissant, cake and bread) and if you wish you can have a cooked breakfast for an extra 5 Euros. The rooms were cleaned daily, the staff were thorough but the towels were only changed once. There were a couple of moggies that frequented the veranda and Louis the dog is a character but on the whole they are not annoying - they seem quite indifferent at times. Word or warning: Make sure you get a room on an upper level, well away from the veranda. My friend an I were woken every single night either by people drinking in the bar, sitting on the veranda, parking their hire cars outside our balcony or returning to the hotel drunk in the wee hours! Unfortunately, the staff were not particularly helpful or sympathetic and weren't able to move us to another room so request this before you book. We are thinking about going to the Lassi Aparthotel in an apartment. We stayed at the Lassi Hotel years ago and although basic and lovely location. Where are the apartments located? Are they all ground floor? Any sea views? Going end of August 04. Any advice would be useful. We havn't booked yet so please be honest. Any other good apartments to recoomend. My wife and I stayed at the Lassi Hotel and I have to say this was an experience, The staff were ignorant to the extreme, if you had a problem they would have a look at it in their own time or should I say never. I have read some of the comments about the rooms and I must have been in different hotel unclean dark and glum. The only good thing about the hotel was its position, lovely views over the bay, Pity the accommodation wasn't up to the views. this 'hotel' and have vowed never to return. however this was the first hotel we have been expected to pay for a fridge. small. The view however was very good over the sea and they were clean. unfriendly, unwilling to listen to complaints and rude. just not to the Lassi Hotel! My wife and I will be staying in the Lassi Hotel at the end of August, can anyone tell me whether fridges\air-con etc, are available in the hotel rooms and if so what the cost is. Also what's Kefalonia like pricewise. Is it expensive\cheap\average etc? Where are the best places to visit ? Any recommendations at all would be apreciated. Thanks. We were at the Lassi Hotel form July 13th to the 27th. We found it very clean and the staff extreamly helpfull. We had a wonderful view over the bay of Argostoli towards Lixouri. We have been coming to Cephellonia since 1988 but the first time at the Lassi Hotel I am sure it will not be the last. Geraldine and David Allinson. Nice, clean apartments but dead boring for children/teenagers. It would be nice if the owners invested in a pool table. And keep feeding the kittens! We have just returned from Lassi hotel and our room 18 was damp and smelly. After reading comments on this page before we went, we were hoping that we would be put in the new apartments. As it turned out, we had very good rooms ( with a sea view )at the front of the hotel, which turned out better because the apartments were round the back overlooking the pool ( which could get a bit noisy ). The air conditioning is charged at 6 euro's a night,and the fridge is 15 euro's a week. ( if you are with others in a different room, the fridge keys are the same, and the air con remotes work any, so share the cost! ). Our rooms were cleaned 5 times a week, but the bathrooms get a bit whiffy due to the greek plumbing, but this clears quicker if you run the shower for a couple of minutes and flush your toilet. All in all, a very enjoyable holiday - even walking up THAT hill! We are going to the Lassi Hotel for the first time on July 13th 2003 - Can anyone tell how much the air con cost and how do you go about paying. Been coming to Cephellonia since 1988 and love the island to bits. In the past we have stayed at the Galaxy but unable to get in this year. Hope to hear from someone soon. Thanks Geraldine Allinson. We have stayed at the Lassi Hotel 4 times now. Spiros the owner and all the staff are very friendly, and the rooms are always clean. Suzanne Cloherty - the hotel is about a 5-10 minute walk from the main bars & restaurants - uphill going out but downhill coming home !! Basic but clean. Be aware that the hotel is quite noisy due to the marble floors. You will hear everyone 'flip flopping out in the morning and again in the evenings! Hotel owners were helpful\friendly when I visited in September 2002. Walking distance to a small patch of beach and just a few mins walk to the main road for bars and restaurants. I have just booked a holiday for 6th July 2003 and wanted to know how close the Lassi Aparthotel is to the main town, restaurants and transport etc. Going to be staying at the Lassi Aparthotel for my next holiday. Do they have safety deposit boxes available to rent ? Went here last year, booked it a year in advance and paid for a sea view. Upon arrival we were allocated to a ground floor room with what could only be described as a massive pile of old bricks and building materials as our view - which was also inland. Had to spend the 2 weeks in there - rep just kept telling us there were no other rooms available. Also thought apartment was dirty and quite scruffy to be honest. Complained and got fifty quid back - though originally paid 30 for the sea view! Excellent location, close to Gradaki beach. Clean and linen changed once within a week, towls included. Staff very friendly and helpful. No complaints about hotel at all. Might be a bit quiet for some people but great for us. Just come back in mid July and me and my girlfriend both thought this was a very good hotel to stay in. Ok the room was typically Greek (basic)but this did not spoil the time we had in Lassi.The hotel is ideally placed if you want peace and quiet, not as some of the whingers who were there wanted, entertainment every night. I would recommend this hotel to anyone and the rep Victoria from Olympic holidays did everything to make the holiday run smoothly. Overall a great holiday and good accomadation! We stayed in the apartments (self catering) which are just over 1 year old. Really clean and modern and would recommend then. Not too sure what the hotel rooms were like, we heard mixed comments from the people staying in them. p.s. weve been to kefalonia 4 times with kosmar,i dont think you'll beat them for prices and reps who know what there talking about. havent stayed there but know where it is. bit out of the way but looks ok.try liberatos village or san lorenzothere both up other end of lassi. more expensive but white rocks is lovelly with its own beach.